Yet our ancestors did it. Through trial and error, inspiration, and observation, prehistoric peoples around the world slowly found and built a store of herbal medicines. Early healers were locavores, using what grew close to home; in northern Europe effective herbs included mandrake root (for just about anything from stomach problems to coughs to sleeping problems), black hellebore (a strong laxative), henbane (to allay pain and ease sleep), and belladonna (for sleep and eye problems). Other early drugs, like cannabis, traveled on trading routes from points south and east. Many spices eagerly sought from traders in the Middle East and Asia, such as cinnamon and pepper, were used as medicines as much as seasonings. Early healers knew not only what their local herbs were but how to use them. A Greek physician in Nero's army in the first century, Pedanius Dioscorides, summarized what was known at the time in his multivolume De Materia Medica, one of the earliest and most important guides to drugs. In addition to listing hundreds of herbs and their effects, he described their preparation and recommended doses. Plant leaves could be dried, crushed, and added to potions brewed over slow fires; roots could be harvested, cleaned, smashed into pastes, or eaten fresh. Some could be mixed with wine, others with water. Medicines could be swallowed, drunk, inhaled, rubbed on the skin, or inserted as suppositories. Dioscorides's work guided the use of drugs in medicine for more than one thousand years. He described the poppy, summarized its effects, and outlined its dangers: "A little of it," he wrote in De Materia Medica, "is a pain-easer, a sleep-causer, and a digester, helping coughs and abdominal cavity afflictions. Taken as a drink too often it hurts (making men lethargic) and it kills. It is helpful for aches, sprinkled on with rosaceum; and for pain in the ears dropped in them with oil of almonds, saffron, and myrrh. For inflammation of the eyes it is used with a roasted egg yolk and saffron, and for erysipela and wounds with vinegar; but for gout with women's milk and saffron. Put up with the finger as a suppository it causes sleep." The plant and its magical juice accrued many names as it traveled from culture to culture, from the ancient Sumerian hul gil for "joy plant" to the Chinese ya pian (from which we derived the expression "having a yen" for a drug). The Greek word for juice is opion, which gives us today's word for the raw drug made from the poppy: opium. You can't get it from just any poppy. There are twenty-eight species of poppy, members of the genus Papaver, on earth. Most of them are showy wildflowers that don't produce more than a trace of opium. Only two of the twenty-eight make appreciable amounts of the drug, and only one of these grows easily, suffers few pests, and doesn't require much irrigation. Its scientific name is Papaver somniferum (somniferum comes from Somnus, the Roman god of sleep). This single plant, the opium poppy, still provides the world with almost all of its natural opium. Researchers today debate whether this particular poppy was always so opium-rich, or whether early humans cultivated and bred it specifically to boost the amount of the drug. 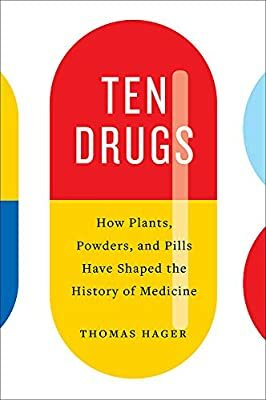 Whichever, by ten thousand years ago it was being grown in much the same way that it is today, and its medicine was being processed pretty much the same way. Two thousand years ago, Dioscorides described how to gather the juice. It's remarkably simple: After a brief flowering, the poppy petals fall off. Within a few days the plant produces a waxy green seedpod that grows to the size of a hen's egg. Harvesters watch closely as the pod starts drying to a dull brown, and at the right moment they make a series of shallow cuts into its skin. These cuts weep the juice that contains the magic. The sap produced in the skin of the pod is where the drug is most concentrated (poppy seeds, used widely in baking and flavoring, contain very little opium). Fresh poppy juice is watery, whitish, cloudy, and almost entirely inactive. But after exposure to the air for a few hours it turns into a brown, sticky residue that looks something like a cross between shoe polish and honey. That is when its medicinal powers are freed. It is scraped off the pod and formed into sticky little cakes, the cakes are boiled to remove impurities, and the resulting liquid is evaporated. The solid that's left, raw opium, is rolled into balls. And those dark, gummy balls changed history. Drugs before the nineteenth century were more than just bundles of herbs drying in the back rooms of witches, medicine men, and priests. They were processed and combined in ways part therapeutic, part magical—boiled into brews and elixirs, shaped into pills, mixed with everything from mummy dust and unicorn horn to powdered pearls and dried tigers' droppings, formed into elaborate concoctions for wealthy patients. Opium was a prize ingredient. It could be dissolved in wine or blended into mixtures with other ingredients. It worked no matter how you took it—orally, nasally, rectally, smoked, drunk, or swallowed as a solid. One method might be a little faster than another, but no matter how it was delivered, it had the same range of effects, from making users sleepy and dreamy to killing their pain.